Adj Backrest Replacement mounting hardware. One set includes all hardware to replace all four mounts. 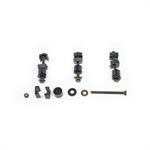 Contains 4 sets complete mounting bolts and nylon components.